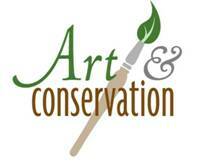 I was pleased this past week to open an email from the Cibolo Nature Center and discover an acceptance letter for the 2012-2013 "Our Hidden Treasures" project for their ongoing "Art & Conservation" program. The every-other-year project, which began in 2007, is a collaboration between the Cibolo Nature Center, Cibolo Arts Council, and the Cibolo Conservancy. The Cibolo Creek watershed and surrounding Hill Country region is not only a treasure to the state of Texas, but is such a remarkable gift of natural diversity that people from all over the nation come here to enjoy its richness. The "Art & Conservation" project juries applicants from a wide spectrum of the visual arts and then pairs the selected finalists with varous landowners from the region (the image I submitted for the jurying process appears below). The properties chosen for the project are veritable jewels of our natural heritage and this collaboration is aimed at highlighting these spaces' unique and precious gifts through creative expression. The selected artists will visit the places that they have been paired with over a period of mostly a year and will have the opportunity of experiencing the seasonal changes in the land. The creative focus is on the natural and unique ambience of these places, and a determined goal of the project is to avoid the inclusion of man-made structures and common artist cliches. I am certainly looking forward to experiencing and expressing the wonder of the place I will visit— a ranch on the Guadalupe River east of Comfort, Texas. As the project unfolds, you'll read about it here. Photography can be defined as the creation of an image through the interaction of light and some material agency. The most obvious and common instrument involved in this process is the device we have come to call the "camera"– what began as the 17th century painter's "camera obscura," or "dark chamber." The camera is an optical system designed for the primary purpose of producing an image (as was the camera obscura). We may glibly speak of "creating an image," but what, exactly, is going on in the process? If you ask most photographers how an image is actually formed in the back of a camera, they might say something like– "Well, it's obvious...the lens in the front of the camera focuses the light from the scene, and the image is produced in the back at the focal point." This answer may satisfy some, but it is a trivial answer and doesn't really provide any significant information. And what about the pinhole camera? This is probably the simplest camera of all, and it doesn't even possess a lens with which to "focus" an image at the back of the camera. The creation of an image is possible through diverse means (at least five that I can think of right now), but all rely on using some simple geometric trick to work. Imagine that the scene before the camera is simply a standard traffic light, with its red light at the top, an amber light in the middle, and a green one at the bottom. 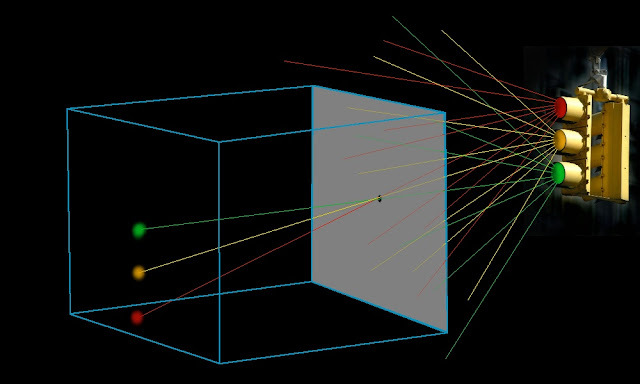 The camera's front wall (in which the pinhole resides) blocks something like 99.999% of the light emitted from the scene which otherwise would end up at the back of the camera. The remaining 0.001% of the light gets through the tiny pinhole and heads toward the back of the camera. Since light travels in a straight line, the few light rays that came from the amber light in the middle of the traffic signal go straight through the pinhole and end up as an amber spot in the middle of the film plane in the back of the camera. Then, the light rays from the red light at the top of the signal, also traveling in a straight line, go through the pinhole and finally strike the film toward the bottom as a red spot. Lastly, the light rays from the green light at the bottom of the signal travel through the pinhole and end up on the film toward the top, making a green spot. If you think about where these spots of light ended up, you can easily see how an image of the traffic signal is being formed on the film, and further, why the image ends up being inverted rather than right-side-up. If you substitute a more complex scene before the camera, the geometry is still exactly the same, with each tiny spot of light in the scene making a corresponding little spot of light at the back of the camera, but in an inverted location. The pinhole is what is commonly called a "spatial filter," or a device which selects only a very narrow geometry of light rays to enter the camera. The pinhole effectively screens out almost all light rays, allowing through only those very few that will contribute to forming an image. The elegance of this system is breathtaking in its sheer simplicity. In a following article I will look at the details of how a lens is able to form an image. This next Sunday (May 6) it will be my pleasure to offer my photographs for public viewing and sale at the annual Artastic! art show and sale near downtown San Antonio. This show is an event hosted and produced by the Sisterhood of Temple Beth-El. 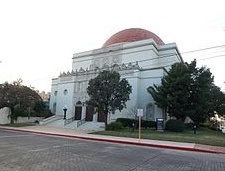 Founded in 1874, the synagogue is the oldest in South Texas. The one-day show runs from 10:30am to 4pm, and Temple Beth-El is located at 211 Belknap, San Antonio 78212. This show always hosts some very interesting and unique artists, from my own fine art panoramic photograpy to unusual cameo jewelry to incredible millinery art (hat/headgear creation taken to the level of beautiful and wearable sculpture). There are over thirty displaying artists, and as usual, admission is free. As well as the opportunity to view and purchase some outstanding art works and speak with their creators, there will also be marvelous food creations for purchase (and consumption!). Come see me and the other wonderful artists at Temple Beth-El this Sunday. —make sure you have registered with my email subscription list to this blog ("Follow Bill by email" box to the right and below), as I will soon be drawing a name at random from this list to receive a free archivally produced panoramic photograph from my "wildflowers" series. The drawing will be held this month, so be sure you don't miss out!